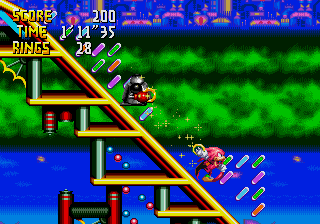 Speed Slider is one of five stages in Chaotix, and the fastest of all present in the game. As its name implies, it is built for characters such as Mighty and Espio, who lack aerial abilities but are quick on their feet. Maintaining speed is a matter of utilizing Ring Power snap techniques and being able to change direction quickly. The stage is notorious for its speed and the presence of an interesting 3D rendered lift that moves up and falls. With this object it is possible to access more places at the zone, and it is really helpful when having to go up quickly. This page was last edited on 23 December 2018, at 17:32.